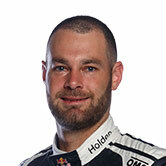 Shane van Gisbergen has continued his strong Sydney run qualifying at the top of the times with a 1min26.9518 lap in the 20-minute session at the Coates Hire Sydney 500. But the surprise of the session was David Reynolds springing to P2 with a hot lap despite tapping the wall at the final corner, 0.0301sec adrift. The final positions will be determined by the ARMOR ALL Top 10 Shootout, where the cars run in reverse order to tackle the track with one fast lap. Reynolds thought he could’ve had the fastest lap if it wasn’t for his late error. He copped exclusion from yesterday’s qualifying session after driving into the paddock rather than parc ferme and was forced to start 26th. “I probably should’ve been quickest, but I drilled the fence on the last lap at the last corner. We’re in the shootout – that was main objective – the car was good,” Reynolds said. Coming home third, Jamie Whincup was focused on saving a set of green tyres for this afternoon. “We just tried a different strategy, tried to save a set of tyres for the race really, that’s the main thing,” he said. A red flag stopped the session with five minutes remaining so debris could be removed form the circuit. 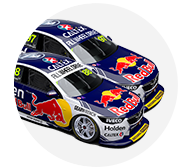 The order in qualifying – from 10 to one – is Todd Kelly, Nick Percat, Garth Tander, Tim Slade, Michael Caruso, Scott McLaughlin, James Courtney, Whincup, Reynolds and van Gisbergen. Big omissions from the 10 include Mark Winterbottom 13th, Craig Lowndes 14th and Chaz Mostert 19th.